Choosing the right adhesive for an intended application involves more than reading a few specifications on a data sheet. Instead, adhesive selection is perhaps best viewed as both an art and a science, where selecting the best formula for the job involves balancing many properties. For example, bond strength, flexibility, temperature resistance, ease of application, and thermal conductivity are just a few of the many qualities to consider when selecting an adhesive. The importance of each of these qualities can be thought of on a continuum, where certain properties are of critical importance to the application, and others are of lesser concern. Here we will take a look at silicone adhesive systems, whose main strength lies in a unique combination of flexibility, temperature resistance, and more specialized engineering properties. Silicone adhesives are available as both one- and two-part systems for use in bonding, sealing, coating, potting, and encapsulation applications. One-part liquid and paste systems are the easiest to use, because they require no mixing. Also known as room temperature vulcanizing compounds (RTVs), they cure by using moisture available in the environment. In contrast, two-part systems cure by using a polymerization reaction that takes place with the addition of a curing agent. In general, two-part systems can cure in thicker sections than one-part systems, which may be required in certain applications. 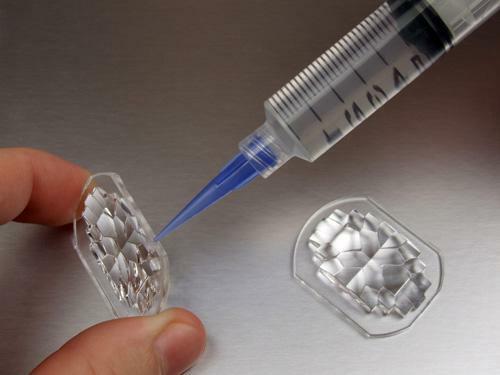 Other useful varieties of silicone adhesives cure upon exposure to ultraviolet (UV) light, electron beam (EB) radiation, or slight contact pressure. All are useful methods in applications where excessive heat generation is a concern. Silicone adhesives have several important performance characteristics that distinguish them from other adhesive families. Overall, users can rely on silicones to create bonds that withstand high temperatures (as high as 600F for certain grades), stay flexible even after curing, and resist both chemicals and water. Silicone systems also feature impressive electrical properties and may be formulated to be insulative with high dielectric strength or, conversely, electrically conductive. Although some one-part silicones release corrosive entities such as acetic acid, special noncorrosive formulas are available and are well suited for electronics applications. For example, these specialized silicone adhesives are frequently used as conformal coatings for electronic circuit boards and for sealing cables and sensors in appliances and electronics. Within the broad classification of silicone adhesives are specific product types that feature unique advantages. To make the best selection, it is wise to discuss application details with your adhesives supplier at the earliest opportunity. One-part silicone adhesives, sealants, and coatings are often used in optical and electrical applications for assembly and repair tasks. Within the one-component family of silicone systems are a wide variety of specialized products offering various features. All products are environmentally friendly and free of both solvents and diluents, are easy to apply, and provide superior flexibility along with high-temperature resistance. They are well suited for strong adhesion to glass, plastics, metals, rubbers, and other substrates. Among their chief benefits is ease of use: They cure at ambient temperatures without the need for additional curing agents and are available with user-friendly applicators. Beyond these common features, specialized product grades offer optical transparency and resistance to vibration, shock, enhanced heat, and corrosion. Other one-part silicones are designed to withstand extreme humidity, provide electrical insulation, or conduct heat and electricity, among other application-specific qualities. Certain grades are certified to meet military standards (MIL Specs) and UL requirements for flame retardance. To understand just how versatile one-part silicone systems can be, it’s helpful to take a closer look at some individual products. Consider the widely specified MasterSil 705TC, an easy-to-use, thermally conductive, electrically isolating, high-performance silicone employed in bonding, sealing, and coating applications. It comes as an off-white, noncorrosive paste and readily cures at ambient temperatures using only atmospheric moisture. It is especially well suited for thermally conductive applications where the need to rework the assembly may be important. Another one-part silicone used for bonding, sealing, and coating is MasterSil 415, which features high transparency and is especially useful in optical and display applications. This easy-to-use paste can be applied to vertical surfaces without sagging or running, and it cures to a flexible, rubbery solid when exposed to moisture in the air. Setup time is 8-12 minutes at 75F. MasterSil 415 can be used over a temperature range of -185F to 400F and is useful where low-temperature reliability is of critical importance to the application. This formula also withstands vibration, shock, impact, exposure to moisture, and other weather conditions and is FDA-compliant. Two-part silicones, also called addition curing systems, employ a combination of a silicone polymer plus a catalyst to initiate the cure. Although these two-part systems are not quite as easy to use as one-part silicones, they offer several advantages compared to their simpler counterparts, especially in production environments. Because a catalyst is required to initiate the cure — rather than ambient moisture — two-part silicones have no problems with section thickness. Therefore, they are well suited for applications such as potting, encapsulation, and large castings. Another advantage is they release no reaction byproducts, so they can be used in closed environments. Because their cure can be accelerated with heat, some systems can be treated with a fast, partial heat cure to enable a quick setup of the adhesive, after which the work piece is allowed to finish curing at room temperature off the production line. Due to their flexibility, two-part silicones feature stress-relieving capabilities over a wide temperature range and provide resistance to vibration, shock, corrosion, and heat. They offer strong adhesion to glass, plastics, metals, rubbers, and other substrates. Within the two-part silicone adhesives family, specific product formulations feature resistance to humidity and temperature extremes, superior flexibility, electrical insulation, and thermal and electrical conductivity. Certain two-part systems are approved for use in specific industries, such as those certified to meet USP Class VI for biocompatibility. Despite these advantages, it’s important to note that certain substances and substrates may inhibit the curing of these two-part systems. Users must be aware of materials in the application and cure area that might cause this inhibition. For example, it is very important to avoid contamination from other silicones that are cured using metallic salts, chlorinated rubber compounds, PVC plasticizers, amines, sulfur-containing materials, and butyl elastomers.